Alibaba Cloud Object Storage Service (OSS) is an encrypted, secure, cost-effective, and easy-to-use object storage service that enables you to store, back up, and archive large amounts of data in the cloud, with a guaranteed reliability of 99.999999999%. RESTful APIs allow storage and access to OSS anywhere on the Internet. You can elastically scale the capacity and processing capability, and choose from a variety of storage types to optimize the storage cost. Provides easy access to OSS on the Internet by using RESTful APIs and multi-language SDKs. Provides the console, clients, and data migration tools to easily upload data to and download data from the cloud, and to easily retrieve and manage data. Allows you to easily configure expired data deletion or store the data in cost-effective archives. Allows the elastic expansion of the storage capacity and processing capability, to store an unlimited number of files. Supports jpg, png, bmp, gif, webp, tiff, and many other file formats, along with features like format conversion, thumbnails, cropping, watermarks, scaling and other operations. Offers high-quality, high-speed parallel audio/video transcoding capabilities so you can easily prepare audio/video files for any device. Accelerates content delivery with OSS as origin site and ensures stability with no retrieve from the origin bandwidth restrictions. Supports Hadoop and enables Hive bulk processing or Impala and Spark interactive query and analysis. 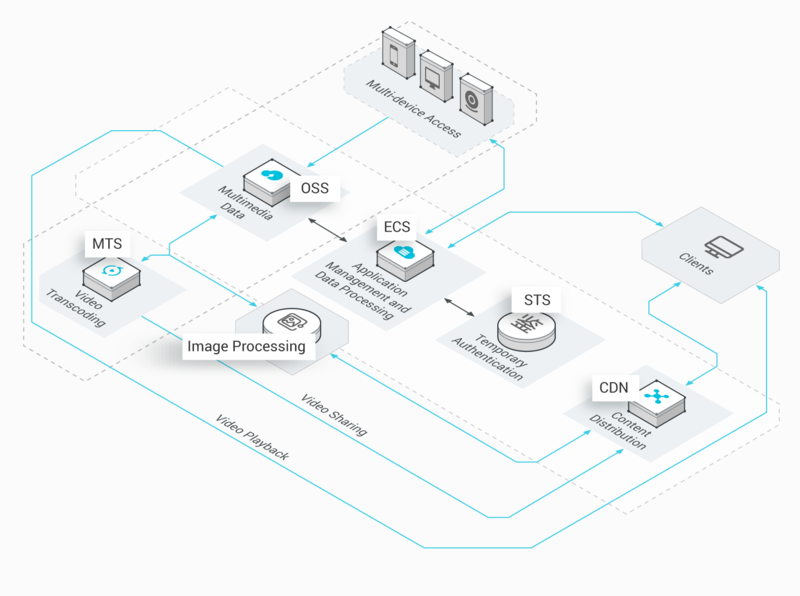 Supports seamless integration with Alibaba Cloud Elastic MapReduce (EMR), Data Lake Analytics, MaxCompute, BatchCompute, and Machine Learning Platform for AI (PAI), and works as an integrated data lake to complete offline computing tasks, interactive query, machine learning-based training, and BatchCompute applications such as DNA sequencing and film rendering. Provides multiple backups to effectively mitigate the impact of multiple hardware failures. Provides fully redundant infrastructure to eliminate the possibility of single points of failure (SPOFs) and guarantee high availability. Supports cross-region replication and disaster recovery solutions to enable remote disaster recovery. Supports Resource Access Management (RAM) users for resource access management, Security Token Service (STS) for temporary access authorizations, and fine-grained access control based on buckets, directories, and objects. Supports server-side and client-side encryption, anti-leech, and HTTPS-based protection, to secure your data. Provides classified storage to minimize the Total Cost of Ownership (TCO). Provides the Pay-As-You-Go and subscription billing methods, and flexible metering and billing, to reduce the cost of storage. Uses the transmission bandwidth offered by multiple Internet service providers (ISPs). Uploading data to OSS is free. Supports fully-managed storage, so you do not need to pay for additional operation and maintenance. OSS is the cost-effective and elastically scalable storage service. You can manage all static website content such as images, scripts, and videos, and store this content in the same way that you store folders in OSS, and access nearby resources using Border Gateway Protocol (BGP) or Content Delivery Network (CDN) acceleration. 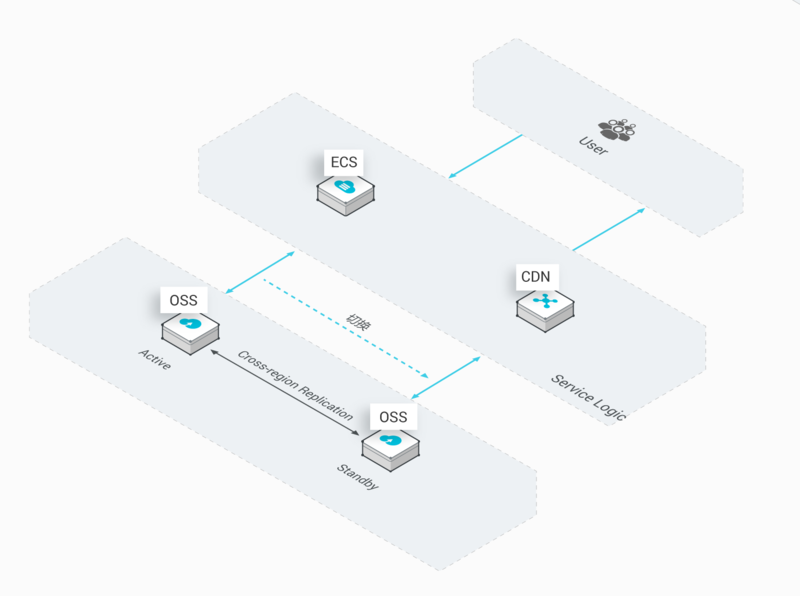 In this way, OSS can effectively reduce the load of ECS instances and improve user experience. Prevents overloading on instances that is caused by increasing service data volumes. 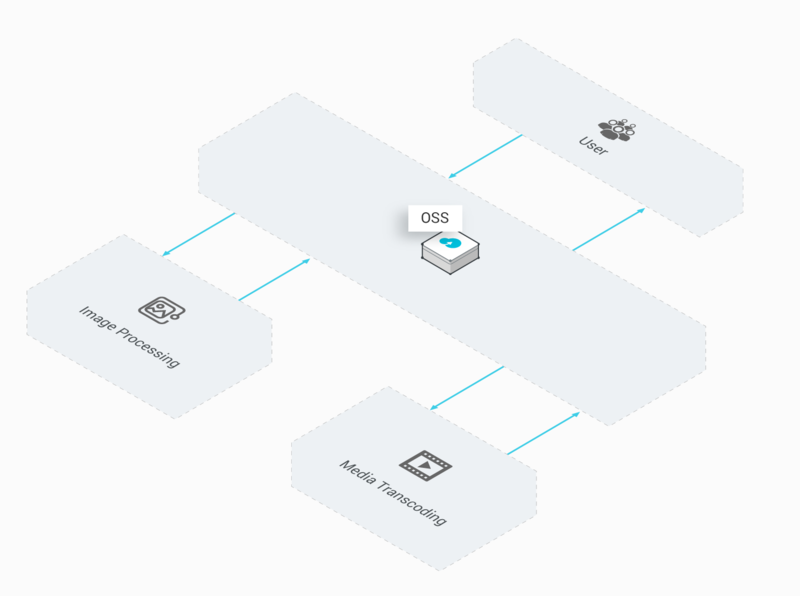 Supports the elastic scaling of resources and the Pay-As-You-Go billing method. 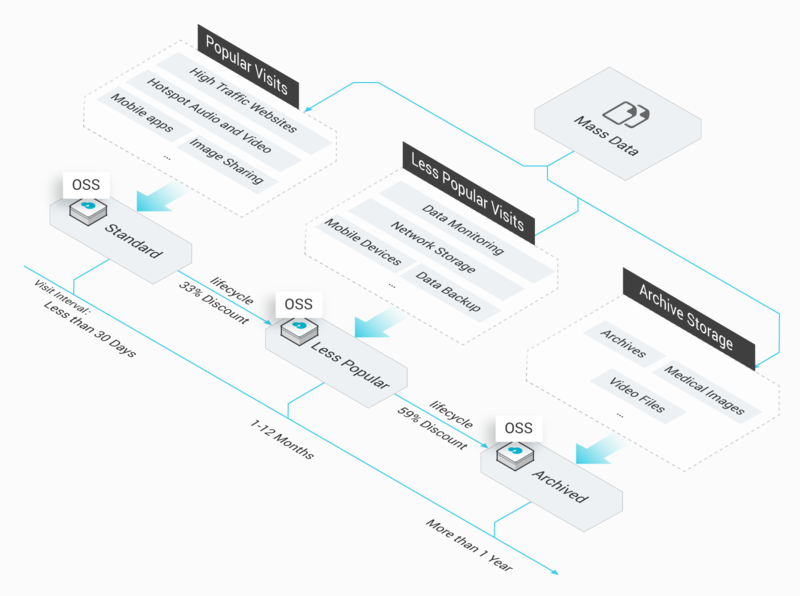 Alibaba Cloud OSS provides mass data storage options for multiple types of content, such as images, audio, videos, logs and other files. OSS supports multiple types of terminals, Web applications, and mobile apps, and allows them to write data to or read data from OSS directly, and to write to both streams and files. OSS secures data with a reliability of 99.999999999%, and enables seamless access to CDN and Media Transcoding Service (MTS). Provides easy access by using standard RESTful APIs, multiple SDKs, clients, and the OSS console. Multi-level security measures ensure data reliability. Supports the elastic scaling of resources and flexible billing methods. You can extract more value from your data, because data processing is simplified with Alibaba Cloud OSS. You can use MTS, image processing service, BatchCompute, and MaxCompute to fully extract the value of your data that is stored to OSS. Provides image processing, user-defined functions, and other value-added services, and works with MTS to provide video transcoding and frame capturing. Uses Alibaba Cloud data computing services to extract the value from your data. Classified storage substantially reduces costs. You can store all types of data in OSS, such as popular data including images, audio, and videos, less popular data including backups, and archived data. According to the specified lifecycle, OSS transfers data to the corresponding storage type at a lower price, and optimizes the storage cost. Features high performance, high reliability, and high availability. Suitable for long-term archival storage at the lowest price. Therefore, you can synchronize data to a specified region in real time for remote disaster recovery. In this way, OSS secures important data from the impact of extreme disasters and ensures service stability. Maintains your service with data that has been replicated to the remote standby data center. 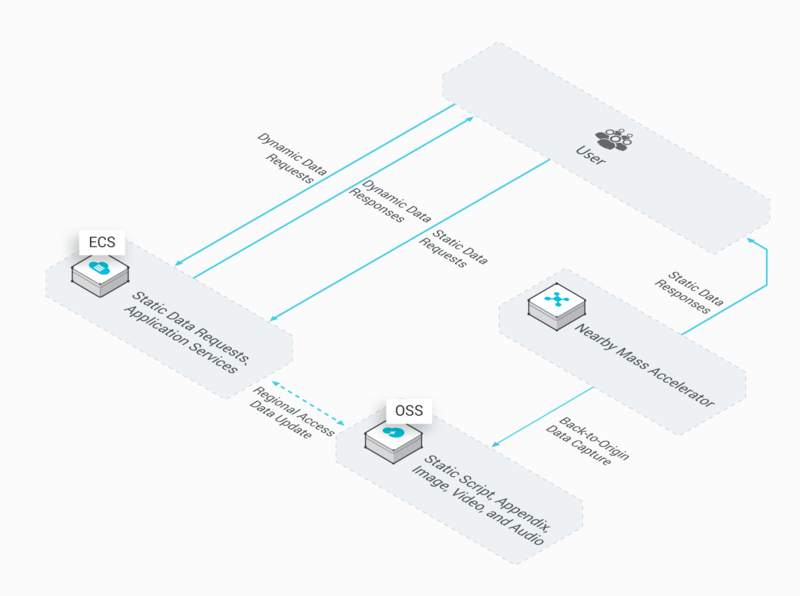 Replicates data between remote OSS data centers to meet data compliance requirements.